Background: The Hantzsch ester, diethyl 2,6-dimethyl-1,4-dihydropyridine-3,5- dicarboxylate, has been used as a hydride donor and its various biological effects have been reported. To identify chemotherapeutic agents with apoptotic effects, 21 diethyl 2,6-dimethyl-1,4- dihydropyridine-3,5-dicarboxylates were designed and synthesized; they have not been reported as apoptosis inducers thus far. Their structure-cytotoxicity relationships were investigated. Further biological experiments were performed on the title compound. Methods: The cytotoxicities of the current synthetic compounds were measured using a clonogenic assay in HCT116 human colon cancer cells. 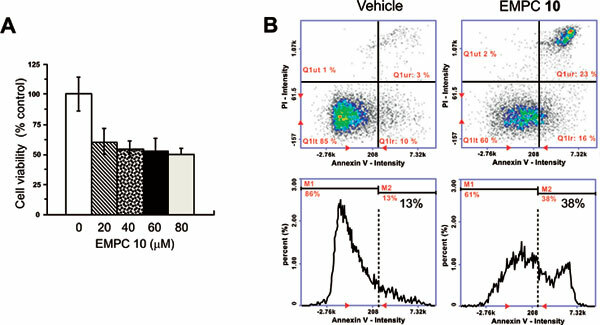 An annexin V staining assay was used to confirm if the title compound induced apoptosis. To identify the synthetic compounds, Nuclear Magnetic Resonance (NMR) spectroscopy and high-resolution mass spectrometry (HR-MS) were conducted. As molecular symmetry was observed in the NMR spectroscopic data, the three dimensional structures were determined from ab initio calculations and X-ray crystallography. Results: The results obtained from NMR spectroscopy, ab initio calculations, and X-ray crystallography revealed that the diethyl 2,6-dimethyl-1,4-dihydropyridine-3,5-dicarboxylate derivatives synthesized in this research have symmetric structures. The cytotoxicities of the 21 derivatives were tested in the HCT116 human colon cancer cell lines, and their half-maximal cell growth inhibitory concentrations ranged between 16.29 and 68.88 µM. Structure-cytotoxicity relationships demonstrated that bulky substitutions were preferred, para-positioned substituents tended to have better cytotoxic values, and the polarity may have a function as well. The cytotoxicity of the title compound in HCT116 colon cancer cells was mediated through apoptotic cell death. Conclusion: To obtain chemotherapeutic agents that induce apoptosis, 21 diethyl 2,6-dimethyl- 1,4-dihydropyridine-3,5-dicarboxylates were designed and synthesized. NMR spectroscopy, ab initio calculations, and X-ray crystallography demonstrated that the diethyl 2,6-dimethyl-1,4- dihydropyridine-3,5-dicarboxylate derivatives synthesized in this research had symmetric structures. Even if the half-maximal cell growth inhibitory concentrations of the 21 derivatives did not show dramatic inhibitory activity against HCT116 human colon cancer cells, small changes in the structure affected the anticancer activities. Treatment with diethyl 4-(4-chlorophenyl)-2,6- dimethyl-1,4-dihydropyridine-3,5-dicarboxylate substantially reduced the cell viability and the cytotoxicity against HCT116 colon cancer cells was mediated through apoptotic cell death. As the ability of diethyl 2,6-dimethyl-1,4-dihydropyridine-3,5-dicarboxylates to induce apoptosis has not been previously reported, we have now reported their design, synthesis, cytotoxicity, and structureactivity relationships. Hantzsch ester, diethyl 2, 6-dimethyl-1, 4-dihydropyridine-3, 5-dicarboxylates, apoptosis, clonogenic assay, NMR spectroscopy, X-ray crystallography.